Lancashire. Kind of west of Wigan, and NE of Liverpool. So, what's it doing here? Well, first things first - the section just to the west of M6 is upgraded from an A road. It opened as part of the A506. Is that enough to put it in here? How about the fact that it has a huge number of CBRD's Bad Junctions? There's three of them, one for every four miles. As well as that, Junction 2 is completely missing, though it was meant to be west of Bickerstaffe and was to be an interchange for the M59. OK, so it's pretty rubbish then? Yeah, and have I mentioned the single carriageway bit? What? A single carriageway bit? Simple really. Like all the best Pathetic Motorways, it's missing a bit. Stand up and be counted, the Mid-Lancashire Motorway! Whilst we've been waiting for this extension, a narrow single-carriageway link road from the M6 northwards to A577 has acted as the end of the route. The junction with the M6 is designed to have the M58 flying way over the top of the whole thing, and landing on the far side on the way towards Wigan - there's great big space for a flyover, with the earth mound waiting to be used. Of course, it never will be. It certainly is. Have I mentioned the western end yet? Oh yes, that's right! The motorway was meant to continue in a south western direction, crossing the M57 just east of the delight that is Switch Island, the current terminus, and head in towards Liverpool. So, what's the history lesson? Well, perhaps surprisingly, the M58 per se does not appear in the 1949 Road Plan for Lancashire - though a route roughly along the route does. Route 215 as it was snappily titled, was to provide bypasses for Up Holland and Skelmersdale (in the days prior to the New Town), along with general improvements to the route between Wigan and the A570. Leaving Route 210 [A570] at Four Lane Ends, Bickerstaffe, the route proceeds along B.5192 for 1/2 mile, then a new road by-passes Skelmersdale on the south, and joins A.577 near Tawd Bridge. Continuing along A.577 to Holland Moor, the route leaves the existing road to form a southern bypass of Upholland, and passing under the North-South Motorway [M6], connects with a new road into Wigan at Lamberhead Green, which forms one of Wigan County Borough's proposals. For the next few years, nothing much happened. Then, in 1961, Skelmersdale was designated as a New Town. In common with all the other New Towns, it was decided that in order to attract investment in the town, and to entice people to live there, there should be a good connection with the national motorway network, and to that end the route was diverted to the south of the towns, though some mapping showing the earlier, more northerly route, was still being printed in the mid-1960s. In addition to that, as Skelmersdale was a Merseyside overspill, improved communications with Liverpool were considered to be necessary. 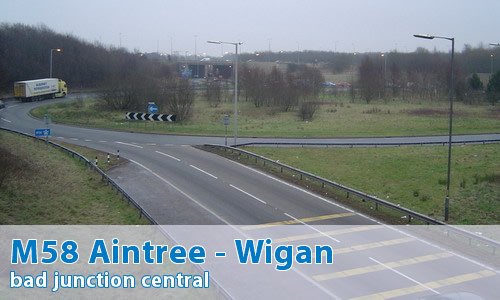 Therefore the planned route was extended to the west, to the A59 at Aintree and would eventually be connected to the proposed Liverpool - Preston Motorway. Construction started on the route in 1968, when the first section (of what at the time was called The Regional Road) was constructed. This section ran from a temporary junction with B5192 to the present location of junction 5, and perhaps surprisingly was constructed as a simple two-lane single carriageway. A couple of years later, in 1970, the section between junction 5 and the M6 was constructed, but this time as a two-lane dual carriageway. At this stage, the road wasn't even a Trunk Road, but was under the control of Lancashire County Council - though that was to change in 1972. Once under Ministry control, an upgrade process took place - hard shoulders being added to the eastern section, whilst a second carriageway and hard shoulders were added to the western section, with this work being completed in 1973. Finally, in 1977 the entire section had yet another upgrade, with a third lane being added and the route brought up to motorway standards - though it still wasn't under motorway regulations. All this activity puts it up there with the M531 as one of the most upgraded motorways in the country! Finally, in 1980 the section between the A59 at Switch Island, Aintree and Skelmersdale opened - at which point the entire road became M58. OK, OK - let me see what it looks like! I quite enjoy the M58, especially in the direction which your images were taken in. It is always surprising how underused it is, especially when it links Liverpool to the M6. As you might have thought when driving around the area, the M58 at its terminus on the M6 does get jammed easily during rush hour with Wigan people commuting to Skem/Pimbo...hence the reason for Part Time Signals. At the Switch Island end, it always strikes me as being strange that Kirkby and the Knowsley industrial estate doesn't have a higher capacity link. The A506 around these parts is a mere country lane and wasn't upgraded as part of the Kirkby New Town Scheme. Admittedly, Kirkby does have the M57 and the East Lancs. The big gap beneath the Railway Bridge near Maghull hints that the M58 was meant to free-flow into the A5036; Dunnings Bridge Road. This flows straight to the front door of Seaforth Dock. Its a shame the M58 was never built right the way over to Bolton, it would have made travel around this part of Greater Manchester and South Lancashire so much more "Carefree". The A577 and surrounding routes are constantly jammed, especially through Ince and Hindley. Would the spurs off the M58 flowed onto the A49 around the Pier and Riverway? Rest assured, the overhead signs on the M58 at Switch Island were replaced when the M57 was brought across the Island.